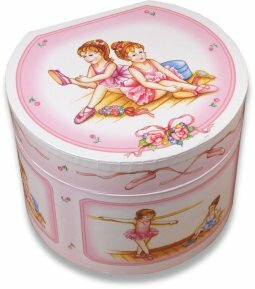 Click on the above link to visit our online catalogue of very pretty music boxes many have ballerinas printed all the way round or on the lid. Lift the lid to reveal the tiny ballerina figurine that turns to the music as it plays. The music boxes are available in wood or made from a thin wood board covered in a matt printed paper with colorful designs. The velvet lined inside is fitted with a clockwork mechanism wound by a key at the back of the box or from underneath. We offer a wide range of choice in music check out each childrens music box on our site to find that special tune to suit the occasion. Childrens music boxes vary in size and figurine colours differ so please take a good look at our range to find the childrens music box to suit your gift requirement. Ready to view our extensive range of childrens music boxes click the link below.